The New Hanover Regional Medical Center’s Family Medicine Residency Program is seeking an individual with leadership and residency program experience to fill the position of Program Director available in the Family Medicine Program. Family Medicine is one of four graduate education residency programs located at New Hanover Regional Medical Center in Wilmington, North Carolina. Other programs include General Surgery, OB/GYN and Internal Medicine. This program is in affiliation with the University of North Carolina at Chapel Hill School of Medicine and the Coastal Area Health Education Center (Coastal AHEC). New Hanover Regional Medical Center is a 769 bed hospital located in ocean port city of Wilmington, North Carolina. Thank You to our advertisers for their support! The applicant must be a Board Certified Family Physician with either an MD or DO degree and experience in residency education as well as practice management and administration. This is a mature program which includes inpatient and outpatient care including maternal – child care. This director works in conjunction with hospital administrative staff for departmental operations as well as Coastal AHEC’s Graduate Medical Education Division of the graduate medical education program. The program offers an experienced and diverse faculty, a state of the art outpatient care center, and an excellent work environment with an electronic medical record. The Family Medicine Program has both an MD and DO residency training pathways. This position offers a competitive salary and excellent benefits package including an academic faculty appointment with the University of North Carolina at Chapel Hill‘s School of Medicine. Please send a letter of interest, and curriculum vitae to: Mark D. Darrow, MD, President/CEO of Coastal AHEC PO Box 9025, Wilmington, NC 28402-9025 Email: mark.darrow@coastalahec.org Fax: (910) 762-3521 UNC-Chapel Hill, Coastal AHEC and New Hanover Regional Medical Center are Equal Opportunity/ADA Employers. Websites are www.nhhn.org and www.coastalahec.org. Are you losing sleep over billing and collections? If your billing and collections system is causing you pain, MAG Mutual Healthcare Solutions, Inc. (MMHSI) has the cure. After we receive your contracted fee schedules, we’ll GUARANTEE an annual net collections rate* of 95% or better or we’ll provide a 5% invoice credit on the annual fees you paid to us. SPECIAL OFFER: If your practice is among the first three practices in North Carolina to sign up for a 12-month MMHSI billing services contract, we’ll waive the installation charge. The offer expires 12/31/06. Call toll free today at 1-888-249-7876 for more details. *The annual net collection rate is the total amount paid to the practice, plus contractual adjustments, divided by the total gross charges billed for one year. A fee credit, if due, will be applied to your MMHSI billing invoice upon completion of twelve months of service. Please call for details. Guarantee effective for new MMHSI billing service clients after 9/1/2006, upon receipt of contracted fee schedules. North Carolina Well Represented at AAFP Annual Congress in D.C.
North Carolina Well Represented at AAFP Annual Congress in D.C. “Fix It Now!” “Fix it Now!” - Those three words represented the refrain of nearly 2,000 family physicians as they descended on Capitol Hill as part of AAFP’s Rally for America’s Health on Wednesday, September 27. Speakers at the rally asked elected officials to make the 2007 session the Health Care Congress. Nearly 40 doctors from North Carolina attended the rally and met with many of the members of North Carolina’s Congressional delegation including Senator Richard Burr, Rep. David Price and Rep. Mike McIntyre. Some of the messages delivered included increased Medicare payments, funding and assistance for implementation of health information technology, a call for medical liability reform and support of primary care graduate medical education. Members of the NCAFP Leadership Team attending the meetings included: President J. Carson Rounds, MD; President-Elect Michelle F. Jones, MD; Vice President Christopher Snyder, III, MD; Board Chair Karen L. Smith, MD; GAAC Chair Robert L. Rich, MD; AAFP Delegate L. Allen Dobson, MD; AAFP Delegate Conrad L. Flick, MD; AAFP Alternate Delegate George H. Moore, JR, MD; AAFP Alternate Delegate Mott p. Blair, IV, MD; Executive Vice President Sue L. Makey, CAE; and Gregory K. Griggs, MPA, CAE, Director of Professional Services on the Academy’s staff. behavior, or development before a child enters school. This should be an opportunity for the parent or doctor to raise concerns that may impact learning and communicate those concerns to the teacher and school nurse. A parent-raised concern may be more seriously addressed by the school if validated by an involved clinician. Also, the Division of Public Health is working with the Department of Public Instruction to improve dialogue back from the school (teacher or nurse) to acknowledge concerns raised by the doctor on the KHA. Completing this communication loop is essential for doctors and parents to feel like this form is of value and worth the effort in assessment. Finally, the Division of Public Health and the advisory committee are evaluating a web-based KHA tool. Currently, they are considering making this an add-on module to the NC Immunization Registry (NCIR). This could evolve into a powerful tool for doctors, parents, and teachers to chart and communicate about heath concerns and an important tool for population-based health surveillance. Details about this are still being developed. By Brian R. Forrest, MD, Chair NCAFP Professional Services Council er. Optometrists have certainly made their voices heard. In recent years they have gained prescribing privileges and have had several other practice-relevant issues addressed legislatively. Why? Because they have had a strong voice. Family physicians now need to be heard because our concerns directly relate to our ability to provide comprehensive care to our patients. Keep this in mind when you get email surveys or questionnaires from the NCAFP or AAFP. Answering these is important because that is one of the ways to know what the needs of practicing physicians are and to hear your voice. Also, when you are considering what organizations to lend your financial support, consider FAMPAC. These contributions help give family physicians a place at the table so that your interests can be represented and not overlooked or pushed aside for other organizations. If every family physician only gave $100 to their PAC then we could actually get something done rather than just being content to grumble about the things that are making taking good care of patients difficult. Why are reports of pertussis on the rise? the Advisory Committee on Immunization Practices (ACIP) of the Centers for Disease Control and Prevention (CDC) has voted to recommend that adolescents 11-18 years of age and adults 19-64 years of age receive a single dose of Tdap vaccine in place of a single dose of tetanus/diphtheria (Td) booster vaccine. ADACEL vaccine provides adolescents and adults with protection against pertussis and may help reduce the spread of pertussis to vulnerable infants. Physicians like knowing that ADACEL vaccine can be used concomitantly with hepatitis B or influenza vaccines and that it has a safety profile comparable to Td vaccine in both adolescents and adults. ACIP also has voted to recommend that healthcare personnel (HCP) who have direct patient contact receive a single dose of Tdap booster vaccine as soon as feasible (if they have not previously done so), especially those who have direct contact with infants less than 12 months of age. The ACIP recommendation redefines the standard of care for preventing pertussis, a vaccine-preventable disease reported at its highest rates in decades. One reason for the increase in pertussis cases may be that immunity to pertussis “wears off” over time—approximately 5-10 years after completing the childhood vaccination series1— which means adolescents and adults who think they have immunity can be susceptible to the disease and may transmit pertussis to infants. Adolescents and adults also tend to have milder forms of pertussis, or even be asymptomatic; but those who develop even mild pertussis disease may still transmit the organism to unimmunized or underimmunized infants. In families, this is often the case. In a study to determine the source of infant pertussis, family members, especially new mothers, were found to be an important source among identifiable cases. The study found that, among 264 cases of infant pertussis infection with a known or suspected source, 75% of the sources were family members and 32% were mothers.6 Therefore, immunization with ADACEL vaccine for parents and family members may help reduce the spread of pertussis to infants. The role of health-care personnel With the availability of ADACEL vaccine for adolescents and adults, HCP need to redefine the standard of care for infant pertussis by immunizing not only the child but all close contacts as well. HCP will play a major role in increasing Tdap immunization. HCP can help reduce the increasing rates of pertussis infection by first making sure that, if they work in hospitals or ambulatory-care settings, they have received immunization with ADACEL vaccine to protect themselves, their patients, and family members. This is especially important for those in direct contact with infants less than 12 months of age. HCP also need to make sure that family members in contact with infants are up-to-date with their pertussis vaccinations and that infants and young children have completed their DTaP childhood vaccination series. Raising awareness among new mothers and their families To help reduce the spread of pertussis to vulnerable infants, HCP and their organizations should develop campaigns to raise awareness among new mothers and their families about the importance of Tdap vaccine. Providers can use existing office visits as an opportunity to increase Tdap vaccinations among adolescents and adults. Through the commitment of HCP, plus the availability of Tdap vaccines, the standard of care for providing protection against pertussis in the US is being redefined. References: 1. Centers for Disease Control and Prevention (CDC). Preventing tetanus, diphtheria, and pertussis among adolescents: use of tetanus toxoid, reduced diphtheria toxoid and acellular pertussis vaccines: recommendations of the Advisory Committee on Immunization Practices (ACIP). MMWR. 2006;55(RR-3):1-44. 2. CDC. National Immunization Program. ACIP votes to recommend use of combined tetanus, diphtheria and pertussis (Tdap) vaccine for adults (Advisory Committee on Immunization Practices): March 2, 2006. Available at: http://www.cdc.gov/nip/vaccine/tdap/tdap_adult_recs.pdf. Accessed March 10, 2006. 3. CDC. Pertussis. In: Atkinson W, Hamborsky J, McIntyre L, Wolfe C, eds. Epidemiology and Prevention of Vaccine-Preventable Diseases. The Pink Book. 9th ed. Washington, DC: Public Health Foundation; 2006:79-96. 4. CDC. Summary of notifiable diseases—United States, 2003. MMWR. 2003;52:1-85. 5. CDC. Pertussis Surveillance Report?8/12/05. MKT11970. 6. Bisgard KM, Pascual FB, Ehresmann KR, et al. Infant pertussis: who was the source? Pediatr Infect Dis J. 2004;23:985-989. Increasing Immunization Coverage May Reverse Rising Reports of Pertussis Many people are unaware that reports of pertussis, commonly called whooping cough, have been rising in the United States (US)1 and pose serious consequences for infants who are too young to be fully immunized.2 Fortunately, in 2005 the Food and Drug Administration licensed 2 combination tetanus/diphtheria/acellular pertussis (Tdap) vaccines, one for adolescents and one for adolescents and adults3; until that time, pertussis immunization was limited to infants and young children. With the availability of Tdap vaccines, the Advisory Committee on Immunization Practices (ACIP) of the Centers for Disease Control and Prevention (CDC) has voted to recommend that adolescents and adults 11-64 years of age receive a single dose of Tdap in place of a single dose of tetanus/diphtheria (Td) booster vaccine. Tdap vaccine provides adolescents and adults with protection against pertussis, and may help reduce the spread of the disease to vulnerable infants. ACIP also has voted to recommend that health-care personnel (HCP) who have direct patient contact receive Tdap (if they have not previously done so), especially those who have direct contact with infants less than 12 months of age. HCP can help reduce the increasing rates of pertussis infection by first making sure that, if they work in hospitals or ambulatory-care settings, they have received Tdap immunization to protect themselves, their patients, and family members. This is especially important for those in direct contact with infants less than 12 months of age. One reason for the increase in pertussis cases may be that immunity to pertussis “wears off” over time—approximately 5-10 years after completing the childhood vaccination series1—which means adolescents and adults who think they have immunity can be susceptible to pertussis and may transmit the disease to infants. Adolescents and adults also tend to have milder forms of pertussis, or even be asymptomatic; but those who develop even mild pertussis disease may still transmit the organism to unimmunized or underimmunized infants. In families, this is often the case. In a study to determine the source of infant pertussis, family members, especially new mothers, have been found to be an important source. The study found that, among 264 cases of infant pertussis infection with a known or suspected source, 75% of the sources were family members and 32% were mothers.6 Tdap immunization for parents and family members may help reduce the spread of pertussis to infants. With the availability of Tdap vaccine for adolescents and adults, HCP need to redefine the standard of care for infant pertussis by immunizing not only the child but also those who come in close contact with the child. HCP will play a major role in increasing Tdap immunization. HCP also need to make sure that family members in contact with infants are up-to-date with their pertussis vaccinations and that infants and young children have completed their DTaP childhood vaccination series. Raising awareness among new mothers and their families To help reduce the spread of pertussis to vulnerable infants, HCP and their organizations should develop campaigns to raise awareness among new mothers and their families about the importance of Tdap immunization. Providers can use existing office visits as an opportunity to increase the use of Tdap immunizations among adolescents and adults. Through the commitment of HCP, plus the availability of Tdap vaccines, the standard of care for providing protection against pertussis in the US is being redefined. References: 1. Centers for Disease Control and Prevention (CDC). Preventing tetanus, diphtheria, and pertussis among adolescents: use of tetanus toxoid, reduced diphtheria toxoid and acellular pertussis vaccines: recommendations of the Advisory Committee on Immunization Practices (ACIP). MMWR. 2006;55(RR-3):1-44. 2. CDC. Pertussis. In: Atkinson W, Hamborsky J, McIntyre L, Wolfe C, eds. Epidemiology and Prevention of Vaccine-Preventable Diseases. The Pink Book. 9th ed. Washington, DC: Public Health Foundation; 2006:79-96. 3. CDC. National Immunization Program. ACIP votes to recommend use of combined tetanus, diphtheria and pertussis (Tdap) vaccine for adults (Advisory Committee on Immunization Practices): March 2, 2006. Available at: http://www.cdc.gov/nip/vaccine/tdap/tdap_adult_recs.pdf. Accessed March 10, 2006. 4. CDC. Summary of notifiable diseases—United States, 2003. MMWR. 2003;52:1-85. 5. CDC. Pertussis Surveillance Report—8/12/05. MKT11970. 6. Bisgard KM, Pascual FB, Ehresmann KR, et al. Infant pertussis: who was the source? Pediatr Infect Dis J. 2004;23:985-989. Increased Vaccination Coverage May Counteract Rising Reports of Pertussis Did you know that reports of pertussis, commonly called whooping cough, have been rising in the United States (US) for years,1 reaching a 45-year high of more than 25,000 reported cases in 2004?2 These statistics show that, although pertussis is a vaccine-preventable disease, it remains a highly contagious health threat—one that poses serious consequences for infants who are too young to be fully immunized.2 Until recently, there were only pertussis vaccines for infants and young children. Fortunately, in 2005 the Food and Drug Administration licensed 2 combination tetanus/diphtheria/acellular pertussis (Tdap) booster vaccines to provide adolescents and adults with protection against pertussis.3 Only one of these, ADACEL® (Tetanus Toxoid, Reduced Diphtheria Toxoid and Acellular Pertussis Vaccine), is licensed for both adolescents and adults. To provide further protection against pertussis, the Advisory Committee on Immunization Practices (ACIP) of the Centers for Disease Control and Prevention has voted to recommend that adolescents 11-18 years of age and adults 19-64 years of age receive a single dose of Tdap vaccine in place of a single dose of tetanus/diphtheria (Td) booster vaccine.3 When there are multiple cases of pertussis in a household, older persons are often found to have the initial case; ADACEL vaccine provides adolescents and adults with protection against pertussis, which may help reduce the spread of the disease to vulnerable infants. Physicians like knowing that ADACEL vaccine can be used concomitantly with hepatitis B and influenza vaccines and that it has a safety profile comparable to Td vaccine in both adolescents and adults. ACIP also has voted to recommend that health-care personnel (HCP) who have direct patient contact should receive a single dose of Tdap booster (if they have not previously done so) as soon as feasible, especially those who have direct contact with infants less than 12 months of age. Pertussis infection has a greater impact on infants than other age groups. Most young infants with pertussis still must be hospitalized, and some cases can be fatal.4 From 2001-2003, 91% of the reported deaths in the US from pertussis were among infants younger than 6 months of age and 75% were among infants younger than 2 months of age.2 Why are reports of pertussis increasing? There are a few factors contributing to the increase in reported pertussis cases: • Immunity to pertussis “wears off” over time, approximately 5-10 years after completing the childhood vaccination series, so adolescents and adults who think they have immunity can still be susceptible to pertussis and may transmit pertussis to infants1 • Adolescents and adults tend to have milder forms of pertussis, or even be asymptomatic; but those who develop even mild pertussis disease may still transmit the organism to unimmunized or underimmunized infants One study to determine the source of infant pertussis found that, among 264 cases of infant pertussis infection with a known or suspected source, 75% of the sources were family members and 32% were mothers. *4 These results demonstrate the need to reduce infant pertussis infection by emphasizing immunization of adolescents and adults. ADACEL recommendations for adolescents, adults, and HCP ACIP has voted to recommend ADACEL vaccine for new mothers and those adolescents and adults who are in close contact with infants less than 12 months of age.3 Specific finalized or provisional recommendations for immunization beyond the completed diphtheria/ tetanus/pertussis (DTP) or diphtheria/tetanus/acellular pertussis (DTaP) childhood vaccination series include: • A single dose of Tdap vaccine for adolescents 11-18 years of age instead of Td for those who have yet to receive a Td booster1 • A single dose of Tdap vaccine for adults 19-64 years of age instead of a Td booster; the Tdap dose is recommended if it has been more than 10 years since the last Td booster, but shorter intervals after Td vaccine are acceptable3 ACIP also recommends that HCP make sure that their own vaccinations are up-to-date, as are those of any family members in contact with infants (especially new mothers) and that all infants have completed their childhood vaccination series. Remember to immunize not only the child but all close contacts as well. To help reduce the spread of pertussis to vulnerable infants, HCP and their organizations should develop campaigns to raise awareness among new mothers and their families about the importance of Tdap vaccine. Through the commitment of HCP, plus the availability of Tdap vaccines, the standard of care for providing protection against pertussis in the US is being redefined. ADACEL Safety Information ADACEL vaccine is indicated for active booster immunization for the prevention of tetanus, diphtheria, and pertussis as a single dose in persons 11 through 64 years of age. As with any vaccine, ADACEL vaccine may not protect 100% of vaccinated individuals. There are risks associated with all vaccines. The most common local adverse events include injection site pain, erythema, and injection site swelling. The most common systemic adverse events include headache, body ache, tiredness, and fever. ADACEL vaccine is contraindicated in persons with known systemic hypersensitivity to any component of the vaccine or a life-threatening reaction after previous administration of the vaccine or a vaccine containing the same substances. Because of uncertainty as to which component of the vaccine may be responsible, no further vaccination with the diphtheria, tetanus, or pertussis components found in ADACEL vaccine should be carried out. Because intramuscular injection can cause injection site hematoma, ADACEL vaccine should not be given to persons with any bleeding disorder, such as hemophilia or thrombocytopenia, or to persons on anticoagulant therapy unless the potential benefits clearly outweigh the risk of administration. If the decision is made to administer ADACEL vaccine to such persons, it should be given with caution, with steps taken to avoid the risk of hematoma formation following injection. Before administering ADACEL vaccine, please see accompanying full Prescribing Information. *It is unknown whether immunizing adolescents and adults against pertussis will reduce the risk of transmission to infants. References: 1. Centers for Disease Control and Prevention (CDC). Preventing tetanus, diphtheria, and pertussis among adolescents: use of tetanus toxoid, reduced diphtheria toxoid and acellular pertussis vaccines: recommendations of the Advisory Committee on Immunization Practices (ACIP). MMWR. 2006;55(RR-3):1-44. 2. CDC. Pertussis. In: Atkinson W, Hamborsky J, McIntyre L, Wolfe C, eds. Epidemiology and Prevention of Vaccine-Preventable Diseases. The Pink Book. 9th ed. Washington, DC: Public Health Foundation; 2006:79-96. 3. CDC. National Immunization Program. ACIP votes to recommend use of combined tetanus, diphtheria and pertussis (Tdap) vaccine for adults (Advisory Committee on Immunization Practices): March 2, 2006. Available at: http://www.cdc.gov/nip/vaccine/tdap/tdap_adult_recs.pdf. Accessed August 23, 2006. 4. Bisgard KM, Pascual FB, Ehresmann KR, et al. Infant pertussis: who was the source? Pediatr Infect Dis J. 2004;23:985-989. North Carolina's patient population continues to diversify, making cultural competency a bigger health care issue now than ever before. Language and cultural barriers can prevent patients from receiving appropriate treatment. Providers, faced with these barriers, find it difficult to diagnose and educate patients. The NCAFP recently received grant funding from the North Carolina Health and Wellness Trust Fund for an initiative to provide physicians with the tools and knowledge needed to help eliminate health disparities. Funding from the grant will be utilized in part for two major educational initiatives aimed at helping physicians provide culturally-appropriate care. The first of these initiatives includes a partnership with The Carolinas Center for Medical Excellence (CCME), formerly known as Medical Review of North Carolina. CCME has created an online course to educate clinicians regarding culturally-appropriate care with the goal of eliminating health disparities. The Culturally and Linguistically Appropriate Services (CLAS) training can be completed in as little as six hours. It's divided into nine modules based around three themes: culturally competent care, language access services and organizational supports for cultural competence. Participants in the CLAS online training can receive up to nine CME credits at no cost. 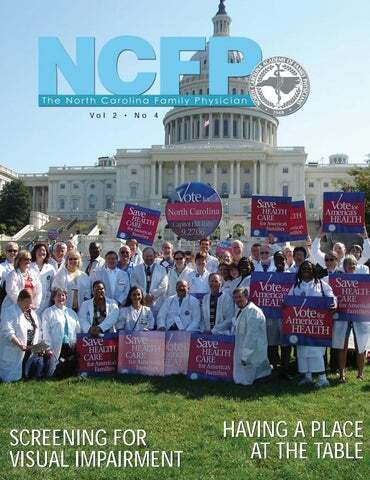 In addition to access to the online training, CCME has developed materials and resources that may be useful to current residents and practicing physicians, including: county and region-level demographic data and information on health disparities; and North Carolina-specific resources on eliminating health disparities and offering culturally appropriate care. For more information about the online training, visit www.thecarolinascenter.org/ncdisparities or call 1-919-380-9860 x2215. The issue of culturally appropriate care will be also prominently discussed during this year’s Annual meeting to be held at the Grove Park Inn November 30 through December 3. Karen L. Smith, MD, NCAFP Board Chair and NCAFP Health Disparities Council Chair, will provide a brief overview of the Academy’s Health Disparities Initiative, prior to a presentation on Culturally Appropriate Care and the Culturally and Linguistically Appropriate Services (CLAS) Standards. Zori Rodriguez, MA, Health Disparities Manager for the American Academy of Family Physicians, will deliver the presentation on Friday, December 1, at 2:15 p.m. For those physicians interested in more in-depth information about Health Disparities in North Carolina and how to implement the CLAS standards in your practice, a special two-hour workshop will be held on Friday afternoon beginning at 5:15 p.m. following the general sessions. The workshop will include: specific strategies to address disparities in the clinical setting; statistics about health disparities in NC; and information on state and national resources. For additional details, please contact Gregory K. Griggs, MPA, CAE, the Academy’s Director of Professional Services at ggriggs@ncafp.com. The NCAFP will be leading provider training efforts as part of a new partnership formed to bring health care services for “mind and body together”. Grants from the Kate B. Reynolds Charitable Trust and Astra Zeneca will allow the ICARE Partnership to pursue its mission to develop systems of care that are Integrated, Collaborative, Accessible, Respectful and Evidence-Based in order to improve access and outcomes for patients requiring mental health, developmental disability and substance abuse services (MS/DD/SAS). The ICARE Partnership was formed to increase collaboration and communication between primary care and MS/DD/SAS providers across the state and improve provider capacity for coordinated services across the health care system. NCAFP PresidentElect Michelle F. Jones, MD, is leading the Academy’s efforts as part of her presidential focus for 2007 and beyond. The N.C. Foundation for Advanced Health Programs (NCAFHP) is actually administering the grant to help launch the ICARE Partnership and to provide initial organizational and grant support. Several other organizations have been tapped to lead various aspects of the project, including the N.C. Area Health Education Centers (curriculum development and website design); the N.C. Psychiatric Association (clinical consultation design); and of course the NCAFP (provider training and technical assistance. Many North Carolinians continue to have inadequate access to MS/DD/SA services and these services are often poorly coordinated with those delivered by primary care providers such as family physicians. Family physicians and other primary care providers are often asked to address unmet MH/DD/SAS needs without sufficient specialty back-up and information services. The ICARE Partnership seeks to improve patient outcomes by increasing access to quality, evidence-based integrated health care services for North Carolina. In addition to the organizations mentioned above, other organizations involved in the project include: Duke AHEC/Duke Department of Psychiatry, the NC Autism Society, the NC Council of Community Programs, the NC Department of Health and Human Services (specifically the Division of Medical Assistance, the Division of MH/DD/SAS and the Office of Rural Health and Community Care), the NC Pediatric Society, the NC Psychological Association, the Southern Regional AHEC, and the WFUHS Department of Pediatrics/NWAHEC. In its initial three years, the ICARE Partnership will focus on three project areas: Statewide Education and Assistance; Local Model Development; and Process and Policy Change. The focus of education and technical assistance efforts in the first year of the project will center on providing primary care physicians with the skills in assessing and managing crisis situations relevant to mental health and substance abuse issues. The first step in this training will take place at the Academy’s Annual Meeting during a lecture on Thursday morning, November 30. In addition, Dr. Michelle F. Jones will provide a brief overview of the project as part of a session on Current Academy Issues on Friday morning, December 1. SCREENING FOR VISUAL IMPAIRMENT The AAFP recommends screening to detect amblyopia, strabismus, and defects in visual acuity in children younger than age 5 years. (1) This statement represents the official AAFP position regarding visual screening in the preschool age child and is supported by the current recommendation from the U.S. Preventive Services Task Force regarding the same subject. Currently, all graduates of U.S. AAFP residencies are taught to perform visual screening as part of the ageappropriate well child screening, and physicians in North Carolina have performed this screening competently for years with little error. NCAFP FOUNDATION SILENT AUCTION - 11 YEARS AND GOING STRONG! The NCAFP Foundation Silent Auction is going into its 11th year and we want you to continue the tradition with us! For 11 years the Silent Auction has been helping the Foundation keep its programs and projects alive and thriving, and this is your special invitation to join us! This fun and popular fundraiser will be held during the Winter Family Physicians Weekend, November 30 – December 3, 2006 at The Grove Park Inn Resort & Spa in the breathtaking mountains of Asheville. This year’s auction will be held on Thursday and Friday in the Exhibit Hall, giving our guests plenty of time to view the items and make their bids. Please consider donating an item(s) to the auction. What are we looking for? Pieces of artwork (paintings, prints, pottery), sports and college memorabilia, weekend getaways, children’s toys, Christmas items and collectibles…and more! Don’t be shy – get in on the fun! And remember – all donated auction items are tax deductible. If you’re interested in how you can be a participant, contact Marlene Rosol, Development Coordinator, at (919) 833-2110, (800) 8729482 [NC only], or mrosol@ncafp.com. Thank you! FOUNDATION GRANTS TWO SCHOLARSHIPS The NCAFP Foundation is pleased to announce that two student scholarships were granted this year. The recipients are Cherrie Crowder and Jessica Triche, both medical students at the ECU School of Medicine. Congratulations, Cherrie and Jessica! All NC medical students are eligible to apply for one of four scholarships yearly. Applications are available through the four FMIG programs. You can also download the 2007 application on the NCAFP website (www.ncafp.com). For more information on student scholarships, or how you can make a donation to the Scholarship Program, please contact Marlene Rosol, Development Coordinator, at (800) 872-9482 [NC only], (919) 833-2110, or mrosol@ncafp.com. Don’t Be Left Behind! (Reelection Reminder) Don’t be left behind! If you were last reelected in 2003, you have until the end of 2006 to report 150 hours of CME in order to maintain your Academy membership. Requirements include at least 75 AAFP prescribed credits, a minimum of 25 group learning activities, no more than 25 from enrichment activities, plus caps on other activities. Hours reported should be obtained between January 1, 2004 through December 31, 2006. For further details, review the AAFP CME Requirements for Members, reprint 101. You can also visit the NCAFP website at www.ncafp.com, the AAFP website at www.aafp.org, or call Marlene Rosol, NCAFP Membership Coordinator at 919-833-2110 or 800-872-9482 [NC only]. KEEP US UPDATED! Members – please be sure to keep all of your contact info up to date! This includes your home and business address, phone, fax, and email address. To update, contact Marlene Rosol, NCAFP Membership Coordinator, at mrosol@ncafp.com, 919-833-2110 or 800-872-9482 [NC only]. Jessica Triche, a fourth-year medical student at the Brody School of Medicine, recently completed a four-week study of obstetrical care accessibility in North Carolina. The research was part of the NCAFP Foundation’s Student Elective Rotation, a self-directed family medicine research/internship program open to all NC medical students who demonstrate an interest in family medicine. Triche is working to finalize a report discussing overall trends and the need for increased accessibility through the use of incentive programs or adaptive prenatal care relationships with obstetricians. Saturday, May 19, 2007 Representatives from several NC residency programs met in Kansas City during the 2006 National Conference to discuss the status of next year's family medicine recruitment day, scheduled for Saturday, May 19, 2007. The event is being sponsored by the NCAFP and the NC AHEC program and is targeted at introducing rising third- and fourth-year medical students to the state's family medicine residency training programs. Participating students will have the opportunity to attend a series of workshops and to meet with residency program representatives. Each student will be provided overnight lodging at no cost. The next planning meeting will take place at 9:00 am on Saturday, Dec. 2, 2006 in Asheville during the Academy's Annual Meeting. work-up and referral of back pain in younger and middle-aged male individuals. A second study focusing on chronic back pain in males and osteoporosis is critical so that early diagnosis and treatment of osteoporosis can be affected while avoiding inappropriate referrals and inappropriate treatment regimens (example: steroid injections into an already osteoporotic back). For a complete copy of the clinical review, email the NCAFP at ncafp@ncafp.com.